Is This Wild Dolphin Doing Belly Flops For Fun? A Pacific white-sided dolphin was recently spotted in the waters off Washington state, giving a brilliant show to a boatful of onlookers. The animal was acrobatically executing a series of "flips," arching his back and bursting out of the water upside-down in quick succession. The behavior may seem like a strange sight - but as it turns out, this isn't such a rare occurrence. Naomi Rose, a marine mammal scientist with the Animal Welfare Institute, told The Dodo that this behavior isn't unusual at all. "Pacific white-sides are very acrobatic," she said in an email. 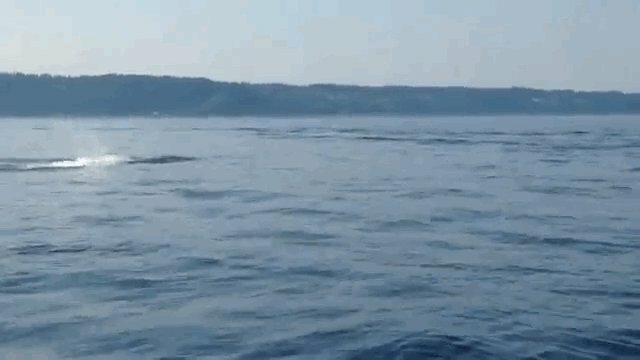 "What you see here is a form of breaching – they come out of the water full-body and may do several in a row, as this animal did." The behavior is similar to porpoising, during which an animal jumps out of the water right side up and moving forward. Porpoising allows the dolphin to move quickly with less hydrodynamic drag. But the behavior in this video is different - it's a less efficient way to travel, according to Rose. The real reason for the jump is only known by the dolphin, but we can make some educated guesses - communication (he makes a fairly loud sound underwater) or knocking parasites off the skin are possibilities. Lori Marino, executive director for the The Kimmela Center for Animal Advocacy, said that the answer is simple. "They are famous for their acrobatics. The behavior is an expression of exuberance and fun!" It's worth noting that the behavior is just as spectacular as that of trained dolphins living in tanks at marine parks - but the animal is living in the wild.